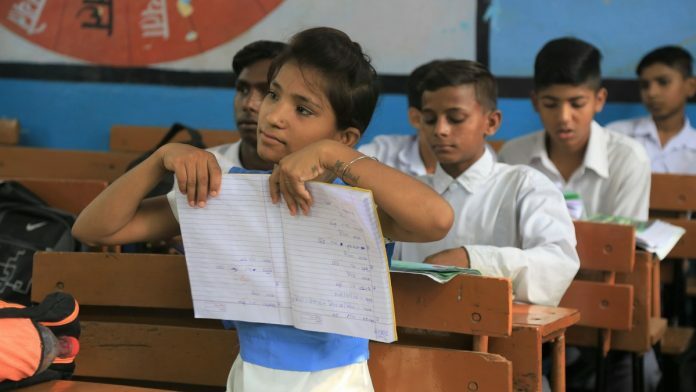 New Delhi: The number of children going to Delhi government schools fell by 8 per cent between 2013-14 and 2017-18, according to a report by Praja Foundation, an NGO working in the education sector. When the Aam Aadmi Party government came to power in 2015, improving education was one of its main promises, and Chief Minister Arvind Kejriwal had said that if voted to power, his party would revamp government schools in such a manner that even ministers would send their kids there. However, the data sourced by Praja under the Right to Information Act paints a dismal picture of education in Delhi, showing a fall in pass percentage and low retention rates. And all this is despite the fact that the education budget for Delhi government schools has constantly been on the rise from 2016-17 to 2018-19. Despite repeated attempts made by ThePrint through phone calls and messages, no one from the Delhi government came forward to comment on the issue, counter the data or give its side of the story. Ever since the AAP stormed to power in the Delhi assembly in 2015, education has been an important issue. The budget allotted for education has been on the rise in the last three financial years — from Rs 7,508 crore in 2016-17 to Rs 7,815 crore in 2017-18 to Rs 10,963 crore in 2018-19. 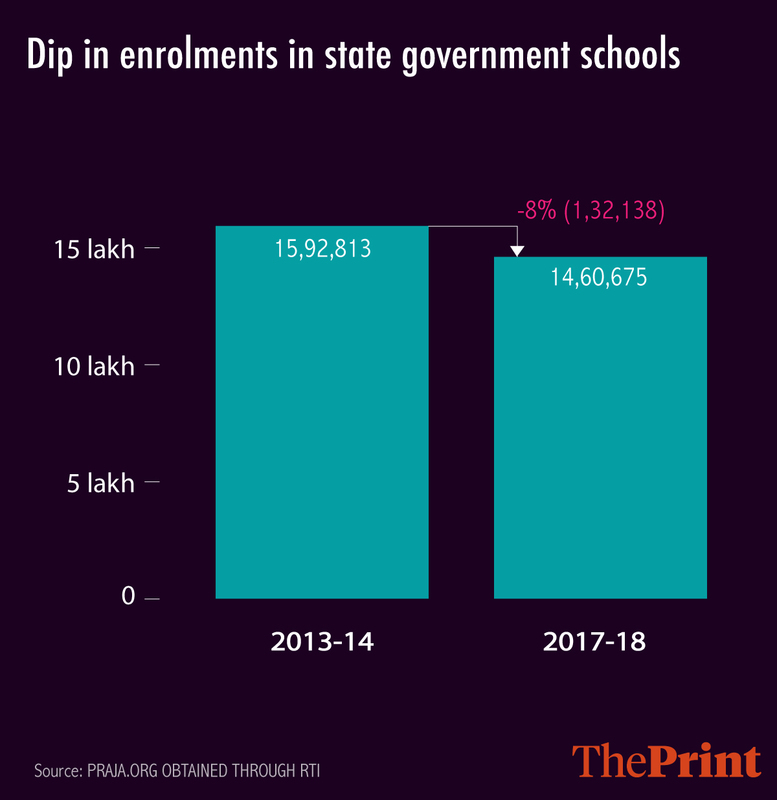 However, as per the figures shared by Praja, the number of students enrolled in Delhi government-run schools declined to 14,60,675 in 2017-18 from 15,92,813 in 2013-14. 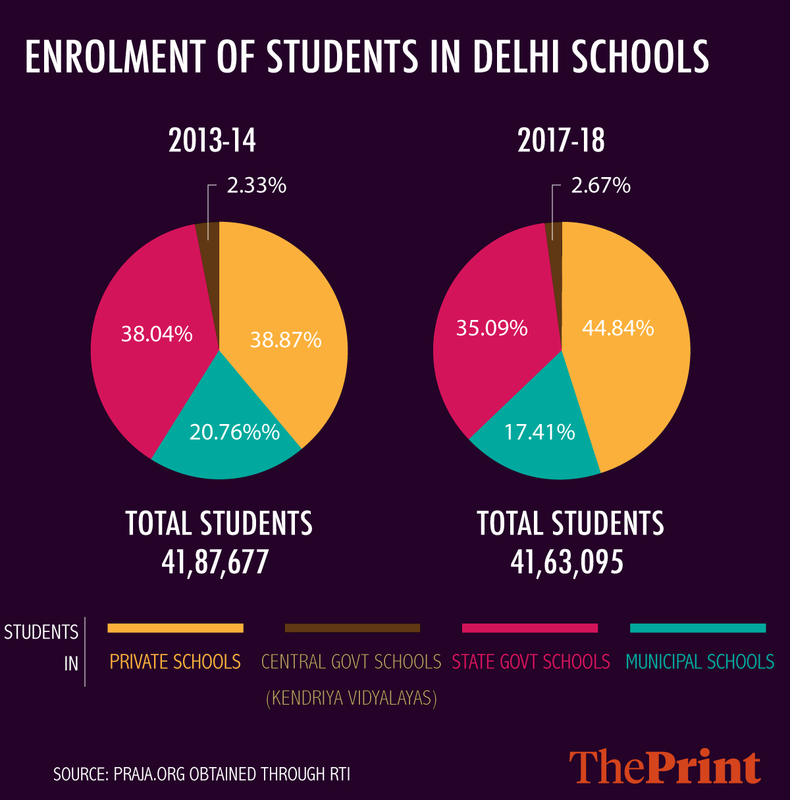 In 2013-14, the number of children going to Delhi government and private schools was almost equal — 38 per cent versus 39 per cent respectively (the rest were enrolled in municipal schools and Kendriya Vidyalayas). However, in 2017-18, the number of children in private schools had risen by 6 per cent. In 2015-16, enrolment in Delhi government schools dropped by 2 per cent compared to the previous academic year. It went up by 1 per cent in 2016-17, but again went down by three per cent in 2017-18. The report also highlights the quality of education in Delhi government schools. Of the 2,59,705 students who got enrolled in class 9 in the schools in 2014-15, 56 per cent did not reach class 12 in 2017-18. The comparative number for Kendriya Vidyalayas was 19 per cent and 26 per cent for private schools. “This shows very poor retention in state schools,” the report stated. Among the students who enrolled in class 9 in 2016-17, 55 per cent did not reach class 10 in 2017-18, while the figure was 24 per cent for KVs and 13 per cent for other schools. “This probably indicates the high amount of students failing in Class 9 and unable to move to Class 10 in state government schools,” said the report. 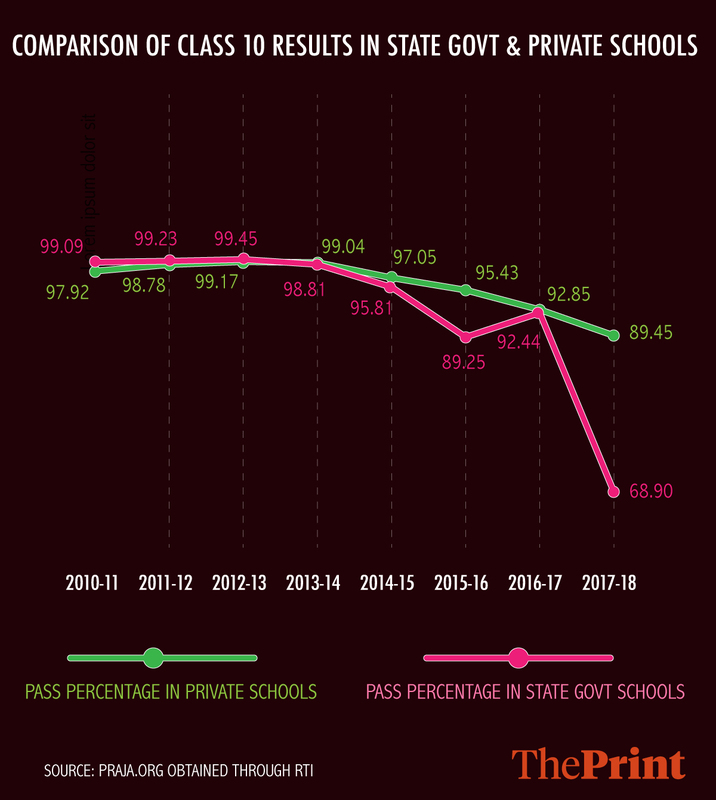 Further, the pass percentage for class 10 in state government schools has also been on a constant decline. From a high of 98.81 per cent in 2013-14, it dropped to 95.81 and 89.25 in the next two years. It then recovered to 92.44 per cent in 2016-17, but then suffered a massive drop to reach its lowest point in eight years in 2017-18 — 68.90 per cent. The pass percentage for class 12 hasn’t seen much change. Activists working in the education sector said a major factor behind these trends was the lack of will on the part of government school teachers. In an affidavit submitted in the Delhi High Court, which has been accessed by ThePrint, the Directorate of Education has admitted that 38 per cent of their teachers are guest faculty. Agarwal denied that the no-detention policy, where students could not be failed until class 8, had anything to do with students failing. “If no-detention policy had anything to do with students failing, this would reflect in the results of private schools also, but it has not,” he said. The Delhi government’s budget outcome for the year 2017-18 also showed a drop in enrolment. As per the report, the government had set a target of filling up 80 per cent nursery seats for the year 2017-18, but was able to achieve only 60 per cent. For 2017-18, the government had set a target of ensuring that at least 66.36 per cent students get passing marks in class 6, 69.55 per cent for class 7 and 73 per cent for class 8. But having failed to hit any of these targets, the goal was lowered to 60 per cent across the board for 2018-19. According to the report, 22 of AAP’s 67 MLAs did not raise any questions related to education in the assembly in 2017. The maximum number of questions were asked by Jagdish Pradhan and Manjinder Singh Sirsa, both MLAs from the Bharatiya Janata Party. Although the total numbers of questions raised by MLAs on education have increased in the last three years, it’s not AAP MLAs who have raised the maximum number of questions, the report said.